To organic or not to organic? 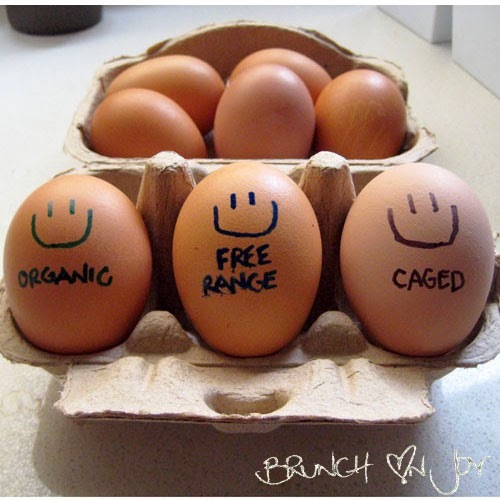 Organic eggs are always that little bit pricier than their other "labelled" friends at the supermarket but is it worth it? Can you tell the difference? Visually, the organic has a lighter colour yolk (due to the feed) and by taste just slightly better than the others. This wasn't really enough to convince me organic eggs are worth it, so I did a blind tasting. Which one is organic, free range and caged? The first random blind tasting proved that I liked the free range and the second time organic. I definitely disliked the floury and unpleasant after taste of the cage. I tried this blind tasting on someone else for a second opinion and they disliked the organic and preferred the cage the first time and then the free range second time. So does it really matter if you buy organic unless you care about the treatment of the chicken? Take the blind test yourself and see which one you like the best!